Thoughts of A Common Man Radio will air on Tuesdays from 10 am to 12 Noon. It’s fun and informative talk radio! 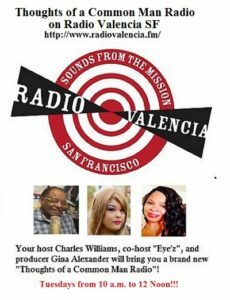 With your host Charles “The Chief” Williams, occasional co-host Eye’z, and Gina “The Producer” we’ll have a great time! We’ll have great guests, in-depth discussions, events, ticket giveaways, plus a lot of great indie, jazz, chill, r&b, and classic soul on deck. Be sure to tune-in on November 1st. You’ll be glad you did!